You are here : Home \\ Short Sale Articles \\ Hayward Short Sale On The Market! Hayward Short Sale On The Market! Hayward short sale just listed on the market and ready for a buyer! East Bay Short Sale Group is happy to announce our new listing at 260 Industrial Parkway #20 in Hayward. This unit is located in a small community off of Industrial Parkway near Mission Blvd in south Hayward. The community has 48 units, is gated, and has a pool and clubhouse. Across the street is Mission Hills Golf Course, an 18 hole course, and is located a couple miles from I-880. This unit is a 1 bedroom, 1 bath condo, 686sq ft ground floor level condo with no steps to entry. Also included is a small walk-out patio. The community has HOA dues that are $409/month and include common area maintenance, security gate, exterior and roof maintenance, pool, hazard insurance, and clubhouse. The seller is current on HOA dues on this Hayward short sale so the buyer would need to assume those at transfer of ownership. This unit in Hayward is being sold as a short sale with the lender being Chase. As such, Chase must approve the final price and net received to the investor. From the time an offer is submitted to Chase we expect it to take 60 days for Chase to approve the short sale and an additional 30 days for the buyer to close on the transaction. 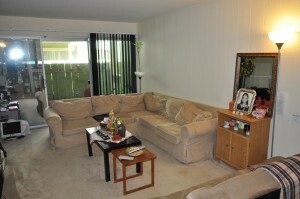 There is a tenant in place who would like to stay and are paying $990/mo for rent. This could be a perfect opportunity for a cash investor to purchase this property and make some great cash flow! If you would like to see this unit, please contact your real estate agent to make an appointment with the tenant for showings. If you are not working with a real estate agent we can help. Contact us and we can arrange a showing. Also keep in mind if you are a seller in Hayward and need to do a short sale, we are the resource to help make this happen. Our website has tons of information on how the short sale process works, and we can also provide a free consultation to explain how the process works, how long it takes, and more of these questions. Thanks for your interest in this Hayward short sale! Previous post: New On The Market, Walnut Creek Short Sale Located in Ashford Court! Next post: Pinole Short Sale Success! Navigation: Weblog / Blog article: Hayward Short Sale On The Market!